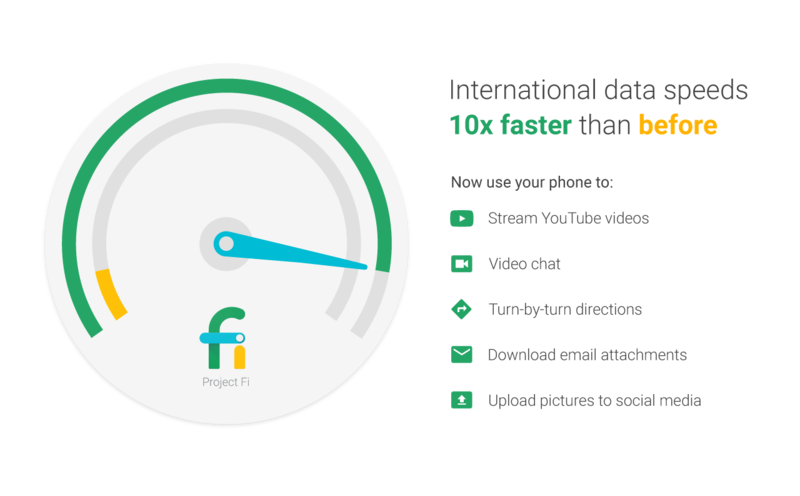 Google announced today on the official Android blog that Project Fi's international data roaming speeds will be up to 10-20x faster than before. "Before" was previously advertised as around 256kbps, so this brings speeds up to or around 2560-5120kbps (2.5-5Mbps, basically), which is pretty much in line with what you can expect on 3G in most countries. This should take Fi's international data from "usable in a pinch" to "usable." The same pricing applies as always: you pay for the data you use abroad at the same rate you'd pay for that data in the US. The new data speeds come courtesy of the addition of Three to the Fi network. Three is a huge multi-national operator, and will bring these enhanced roaming speeds to over 135 countries. In addition, starting at 10AM PST today, July 12th, Project Fi will be offering $150 off a Nexus 6P purchase when you sign up for service. That would bring the 32GB model down to an exceptionally reasonable $349, 64GB to $399, and the top-of-the-line 128GB version $499.